The ozone layer, 15 miles above Earth, protects life on Earth by absorbing the hottest ultraviolet radiation from Sun. When the ozone layer is thinned (depleted), more ultraviolet radiation than usual is measured to reach Earth, raising Earth’s temperature and increasing risk of sunburn and skin cancer. 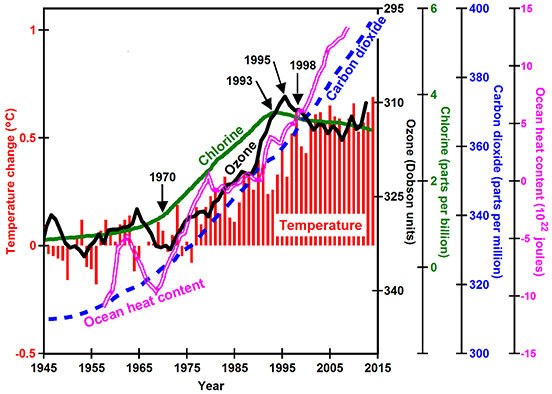 The increase in tropospheric chlorine (green line), caused by manufacturing of chlorofluorocarbon gases, led to increased ozone depletion (black line), which led to increased temperature (red bars). Note how carbon dioxide concentrations continue to increase after 1998, while chlorine, ozone depletion, and temperatures all stopped increasing. Ocean heat content continues to increase because ozone remains depleted. Global warming by one degree between 1965 and 1998 was caused by a rapid increase in manufacturing of chlorofluorocarbon gases (CFCs) used in aerosol cans, refrigerators, air conditioners, and certain fire extinguishers, which depleted ozone, causing the Antarctic Ozone Hole, major depletion in the Arctic, and more moderate depletion at mid-latitudes. Scientists and political leaders worked extremely well together to pass the Montreal Protocol on Substances that Deplete the Ozone Layer, which became effective in 1989, ending the increase in emissions of CFCs by 1993, ending the increase in ozone depletion by 1995, and ending the increase in mean surface air temperature by 1998. Man inadvertently caused ozone depletion, and man acted knowledgeably and decisively to end the increase in ozone depletion, which happened to end global warming. 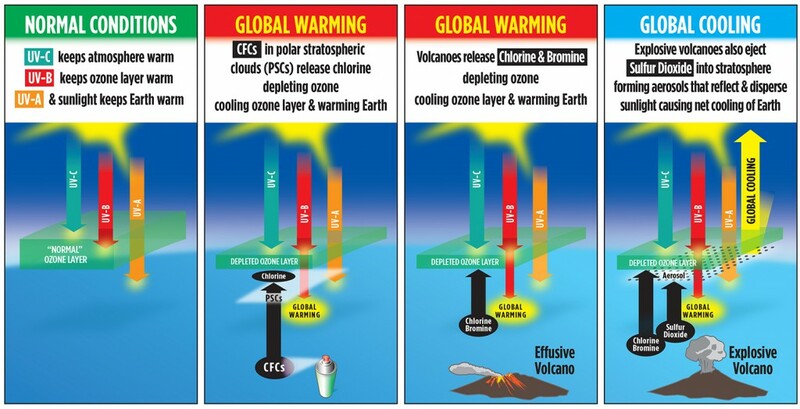 Chlorine and bromine gases emitted by all types of volcanoes also deplete the ozone layer. Effusive volcanoes pour vast quantities of black, basaltic lava out onto Earth’s surface, as is typical in Hawaii or Iceland, depleting ozone and causing global warming. The volcano Bárðarbunga began erupting in central Iceland on September 4, 2014. By February 28, 2015, this volcano extruded the Holuhraun lava field covering an area of 33 square miles (85 km2), the largest basaltic lava field observed in the world since the Laki eruption in 1783. This volcanic eruption appears to have had profound effects on weather, including making 2014 and 2015 the warmest years on record. Explosive volcanic eruptions, such as Mt. Pinatubo in the Philippines in 1991, also deplete ozone, causing winter warming, but in addition, they explode megatons of gases into the stratosphere, just below the ozone layer. These gases, especially water vapor and sulfur dioxide, form aerosols, a fine mist, whose particle sizes grow large enough, over several months, to reflect and scatter sunlight for a few years, causing net global cooling. Large, explosive volcanic eruptions currently occur once or twice per century. When they happen more frequently — many more times per century — they can, over thousands of years, push the world into an ice age. Extensive, voluminous, effusive, basaltic volcanism can warm the land out of an ice age within a few years and can warm the ocean out of an ice age within a few thousand years. Ozone is expected to remain depleted for many more decades, causing the oceans to continue to warm and glaciers to continue to melt. The longer ozone remains depleted, the warmer the oceans will become, and the longer Earth’s warmer climate will persist. Ozone concentrations vary rapidly, especially in late winter and early spring, having major effects on weather, on the basic distribution of air-pressure highs and lows, and on the location and strength of the polar vortex and jet stream, thus affecting weather. The greenhouse-gas theory of global warming, which most scientists consider proven beyond any reasonable doubt, is not only mistaken — it is physically impossible. Greenhouse-gas theory is based on the assumption that light and heat, travel though air and space as waves or as particles. New observations show that light travels simply as frequency, just like the signal from a radio station, and that the thermal energy involved is simply equal to frequency times a constant. Understanding that radiant energy is directly proportional to frequency has major implications for modern physics by simplifying our understanding of quantum mechanics, quantum entanglement, dark energy, dark matter, and gravity. Greenhouse warming theory says that infrared radiation from Earth warms the planet more than ultraviolet energy from Sun. Common experience confirms that this is not true: you get hotter standing in sunlight than in moonlight. Thermal energy in a colder atmosphere cannot raise the temperature of a warmer planet. You do not get warmer standing next to a cold stove. Radiation from a thermal body cannot warm the same body. Otherwise, all material objects would spontaneously heat up until they would ultimately melt or vaporize. We can develop all sources of energy without fear of causing global warming, but we must minimize pollution. We can keep energy costs low because there is no longer a need for special taxes to discourage use of fossil fuels. We do not need to fear the continued warming that has been predicted by current climate models. The models and their predictions are mistaken. We do need to adapt to a world that is now one degree warmer. We do need to protect ourselves from increased risk of sunburn and skin cancer. We should cover up more when in direct sunlight for extended periods of time. We also need to protect our belongings from increased risk of deterioration and color fading when left outside in direct sunlight. Put your lawn furniture away. We should explore ways to restore ozone to pre-1965 levels in order to stop the warming of the oceans, which is pushing Earth’s thermostat higher. We can expect more accurate weather forecasts as scientists gain a better understanding of the link between ozone and meteorology. We should expect improved public policy illuminated by better scientific understanding of the technical issues.